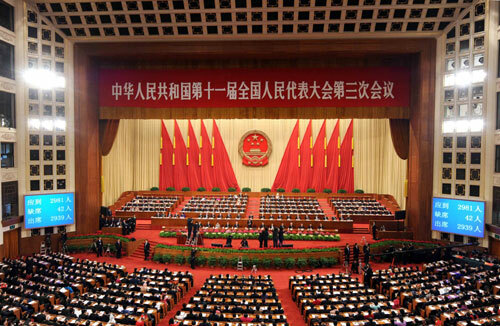 BEIJING - Chinese Premier Wen Jiabao delivered a government work report at the opening meeting of the annual full session of the National People's Congress (NPC), China's top legislature, which started in the Great Hall of the People at 9 am Friday. The following are the highlights of Wen's Report on the Work of the Government. -- China's gross domestic product (GDP) reached 33.5 trillion yuan, up 8.7 percent from a year earlier. -- Fiscal revenue was 6.85 trillion yuan, up 11.7 percent year on year. -- Grain production was 531 million tonnes, a new record and increasing for the sixth consecutive year. -- A total of 11.02 million job opportunities were created for urban residents. -- The per capita disposable income of urban residents was 17,175 yuan, up 9.8 percent in real terms, while the net per capita income of rural residents was 5,153 yuan, rising 8.5 percent in real terms. -- The central government's public investment was 924.3 billion yuan, 503.8 billion yuan more than in the previous year's budget. -- The government invested 654.5 billion yuan to support the post-Wenchuan earthquake recovery and reconstruction work. -- The central government used 725.3 billion yuan to support agriculture, rural areas and farmers, an increase of 21.8 percent. -- A total of 20 billion yuan was provided to support 4,441 technological upgrading projects. -- Last year imports and exports totaled $2.2 trillion. -- Actual utilized foreign direct investment amounted to $90 billion for the entire year. 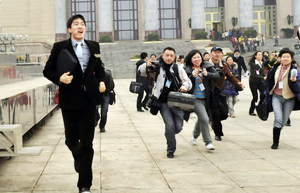 -- The central government spent 127.7 billion yuan on medical and health care, an increase of 49.5 percent. The Chinese government made hefty investment, 44 percent of the total public investment from the central budget, to improve people's livelihood last year. 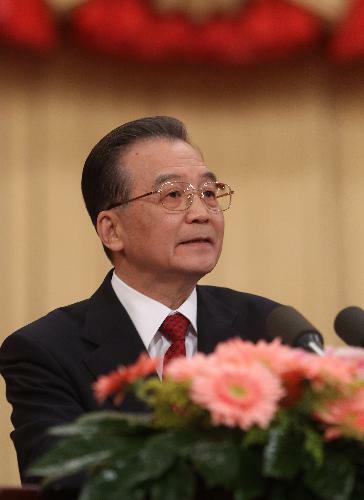 -- Sound development, and transforming the pattern of economic development will be emphasized. China will strictly control the launching of new projects this year in an effort to curb redundant investment, according to the text of the government work report that Premier Wen Jiabao is to deliver Friday. -- A deficit of 1.05 trillion yuan has been projected, which consists of 850 billion yuan in central government deficit and 200 billion yuan in local government bonds, which will be included in local government budgets. -- The total quantity of renminbi loans will be increased by approximately 7.5 trillion yuan. -- Emphasis will be given to helping college graduates, rural migrant workers, people experiencing employment difficulty, and demobilized military personnel find jobs. -- The government will make greater efforts to deal with violations of laws and regulations such as keeping land unused, property hoarding, and price rigging. -- The central government will not only make the "pie" of social wealth bigger by developing the economy, but also distribute it well on the basis of a rational income distribution system. Chinese Premier Wen Jiabao vowed Friday to enhance rational income distribution system as it is an "important manifestation of social fairness and justice" and a major way out for boosting domestic demand and narrowing income gap. -- The central government will allocate 133.5 billion yuan for direct subsidies for farmers, a year-on-year increase of 6.04 billion yuan. The central government plans to allocate 818.3 billion yuan ($119.8 billion) for agriculture, farmers, and rural areas this year, an increase of 93 billion yuan over the 2009 level. China is deepening reforms on its cultural system, such as encouraging state-owned cultural groups to convert to a stake-holding system. -- China will make farsighted arrangements for basic research and research in cutting-edge technologies in the fields of biology, nanoscience, quantum control, information networks, climate change, aerospace and oceanography. -- China will steadily move forward with the pilot program for a new old-age insurance system for rural residents by expanding it to 23 percent of the country's counties. China will reform its household registration system and relax restrictions on permanent residence registration, or "hukou", in towns, small and medium-sized cities.